Japanese traditional sports generally grew out of the various fighting techniques used by the samurai warrior class in feudal Japan. While the samurai were highly important in feudal society, after peace was established by Tokugawa Ieyasu in the early 1600's, their fighting skills were diverted into more spiritual activities. The fighting arts were combined with Confucianism, Shinto and Zen Buddhism as a means of spiritual as well as physical training. Over the years, the names changed also: kenjutsu, for example, meaning Sword Technique changed to kendo or the Way of the Sword to imply the spiritual discipline inherent in these arts. After the Meiji Restoration in 1868 and the subsequent collapse of the samurai class, the martial arts went into a short period of decline until they began to be introduced at schools across the country. But prior to World War II, they were once again encouraged as part of Japan's militarisation. And as a result, during the Occupation, they were banned. But soon after, martial arts federations were set up and once again they found their way back into the school curriculum. The literal meaning of Judo is the Way of Softness. The kanji character for 'ju' is taken from a Chinese military saying that 'softness defeats hardness'. The emphasis in this sport is not on physical size or strength but on agility, balance and practise of waza, or techniques. The never-ending, repetitive practise of these waza or kata (forms) until they become as natural as breathing is central to all martial arts and takes up most of the time spent in the dojo. Jujutsu, the origin of judo, began in the Nara Period (710~794) as a kind of entertainment for the Imperial court. As with other martial arts, it underwent a transformation during the Tokugawa Shogunate and went into decline after the Meiji Restoration. The first judo school was established at the Eishoji temple in Tokyo by Kano Jigoro in 1882. Kano also introduced the system of dan (ranks) and kyu (classes) used today. Shortly after, judo was introduced in schools. Following the Occupation, the All-Japan Judo Federation was set up in 1949, and judo was re-introduced in schools. At the 1964 Olympics in Tokyo, judo made its first appearance as an Olympic sport. Japanese judoka or judoists dominated the sport for many years at World and Olympic levels. Yamashita Yasuhiro (1957~ ) won the All-Japan Judo Championship nine times in a row and the Olympic gold medal (open category) in 1984. The most famous Japanese judoka today is Tamura Ryoko (1975~ ) who for more than 10 years has dominated her under-48kg weight class at the national and World Championship level but only managed to win an Olympic silver medal until finally getting the gold at Sydney in 2000. The two types of waza used in competitive judo are nagewaza (throwing techniques) and katamewaza (grappling techniques). Following recent changes to competition rules, contest duration is 5 minutes (senior men/women), 4 minutes (young men/women, U20 years) and or 3 minutes (juniors, U16 years). Some national bodies have even shorter contest durations for younger children. 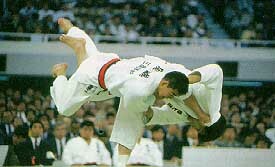 A match can be won by ippon using either type of waza: using nagewaza so that the opponent lands on their back or using katamewaza to hold them for 25 seconds. If a match is tied after the normal duration, a recent innovation is to have an additional period of time where the first to score wins - referred to as the 'golden score'. Sword fencing was probably introduced to Japan from 6th or 7th century China. Kenjutsu grew out of the two-handed sword techniques used by the samurai. In the late 1700's shinai or bamboo swords and protective clothing were introduced to ensure safety. After the collapse of the samurai class, kenjutsu went into a decade of decline until the police started a course for their trainees. Even today, kendo is an important part of police training and police officers dominate the top levels of the sport. In 1952, the All Japan Kendo Federation was established and since then kendo has been part of the middle school curriculum, particularly for boys. The shinai is made of four bamboo shafts, bound with a silk or nylon cord and a leather thong. The length of the shinai depends on the age group of the fencer. The protective clothing has many parts, including a men or face mask, a do (chest) protector, quilted tare or flaps to protect the thighs and kote or fencing gloves. The strike zones are the head, throat, chest and forearms. The key elements are stance, footwork, cuts, thrusts, parries and feints. When training, fencers practise a series of offensive and defensive waza. Competition consists of a match of up to 5 minutes with the winner being the first to score 2 points. A clear hit to the opponent's head, torso or forearm or a thrust to their throat scores a point. 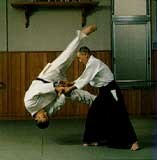 As aikido is purely defensive, it is not really a sport but is one of the martial arts. It was developed from jujutsu by Ueshiba Morihei (1883~1969) who, mainly for religious reasons, wanted to move the art away from its competitive elements. By 1922, he had developed his own techniques which he called aiki bujutsu, aiki meaning meeting of energies. He later renamed it aikido. It consists essentially of using an attackers strength and energy to defeat him. Twists and holds on the arm and leg joints are used to throw or immobilize the attacker. The popularity of aikido has grown in Japan and internationally since the 1960's. Many people from around the world, as well as Japan's own riot police, train at the Yoshinkan Dojo in Tokyo. Aikido is considered by most to be one of the gentler martial arts – it literally means "the way of the meeting of life-force" – and to be as much a philosophy as a form of physical movement. The photo on the left shows Shioda Gozo, the diminuitive founder of the Yoshinkan, effortlessly throwing a much bigger and heavier man and making it look as graceful as a dance move. If a little old guy can do that...It was for this reason as much as anything that I decided to give it a go back in the early 1990s. I had never set foot in any kind of dojo, but no allowances were made for this fact. As in any martial art, or indeed any traditional Japanese art form, the onus is on the student to observe and learn. What I learned very quickly was that I had made a big mistake. I had joined the above mentioned Yoshinkan Dojo as it was close to where I lived. At the time, I didn't realize that this particular aikido dojo was more "physical" than most. But I found out pretty quickly. I was in a group of students who were all pretty new to the dojo, though not necessarily to martial arts. They showed me the ropes, or helped me in my struggle to to find them myself. And I did make a real effort to learn the posture, arm and hand movements and leg sweeps of the basic kata – the latter being a lot harder on my carpet at home than on the tatami mats of the dojo. But what made me rethink my suitability for martial arts was the practice of arm blocks on, I think, my fifth or sixth visit to the dojo. Without wanting to whine too much, the pain I endured as a result of repetitive forearm blocking was not something I had expected to have to deal with at this point. But I decided I could handle it. And with my arms swollen and bruised, I turned up to the next class, during which there was a farewell for one of the sensei (teachers). This involved everyone standing in a circle and, one by one, throwing the sensei to the mat using as advanced or tricky a throw as possible. Now I didn't really know any throws, let alone advanced or tricky ones. But the sensei basically told me where to grab and how to move and next thing he was there on the mat as I lost my balance and fell, too. Not pretty, but I felt a hint of what it was like to belong to the dojo. And then it was time to practice more forearm blocks. "Bugger that, I've had enough pain." And that was it as far as my martial arts career was concerned. Not an effort I'm particularly proud of, but at least I gave it a go. Kyudo (the Way of the Bow) is Japanese archery, which has been practised since ancient times. There are several schools of kyudo, the most prominent being the Ogasawara, Heki and Honda schools. The Amateur Archery Federation of Japan was established in 1949 and membership runs to about 300,000. Archery from horseback is still part of several festivals held each year. Archers wear a traditional costume which includes a yugake (deerskin glove) on the drawing hand and tabi (Japanese-style socks). They stand with a stance equal to half their height. The 2.21 meter bow is held with two thirds of the bow above the grip. As a martial art influenced by Zen Buddhism, the emphasis is on form rather than accuracy. In competition, there are long-range and short-range matches. In the former, the target is 100cm in diameter and 60m from the archer while in the latter, there is a 36cm target at a distance of 28m. Kyudo looks deceptively simple to the uninitiated. But even the simplest of movements must be practiced over and over to make them look that effortless. Even without the bangs and knocks of other martial arts, the barriers to the beginner – aching muscles and endless frustration – are not dissimilar. Although karatedo (Way of the Empty Hand), or simply karate, is usually thought of as a native Japanese martial art in the West, in Japan it is not. It started in the Ryukyu kingdom (modern-day Okinawa) as a hybrid of indigenous fighting techniques and the Chinese form of boxing known in the west as kung-fu. After the Sino-Japanese war in 1895, Okinawa became a prefecture of Japan and karate began to spread to the mainland. The sport developed in Tokyo's universities after the Okinawan master Funakoshi Gichin was invited by the Education Ministry to give a demonstration at Keio University in the early 1920's. Two main schools and many different styles have evolved over the years. Following a postwar decline, the sport became increasingly popular around the world. Karate uses three main techniques: uchi (arm strikes), tsuki (thrusts) and keri (kicks). For each attacking technique, there is a corresponding uke or defensive technique. There are two types of karate competition: in a kata competition, the participants demonstrate a choreographed series of kata, both offensive and defensive; in a kumite (sparring) match, the aim is to be the first to score 3 points within 3 minutes, with a point for each punch, thrust or kick executed correctly. Koryu.com is an online resource for those interested in the "true" martial arts. AikiWeb is a popular and extensive site on aikido. The homepage of Aikido Today magazine. The Bushido Online site has lots information. The homepage of the American Shotokai Karate. USA National Karate-do Federation official website. A good general site about kendo.